Nail art is not your average manicure! Nail Art transforms nails through painting, embellishing, and/or decorating them. Your nails are the canvas! This also includes all types of 3D nails, and custom painted stick on nails. It is an artistic process which involves special care of the nails. Your nails can be decorated with designs and colors that can range from plain prints and glitter to crystal and abstracts. It can be performed on both fingernails and toenails- its point is to always create something new and original. 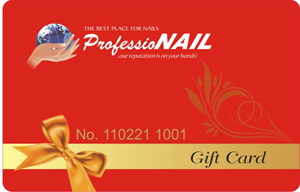 Please ask your local ProfessioNAIL store about the types of nail art they offer.